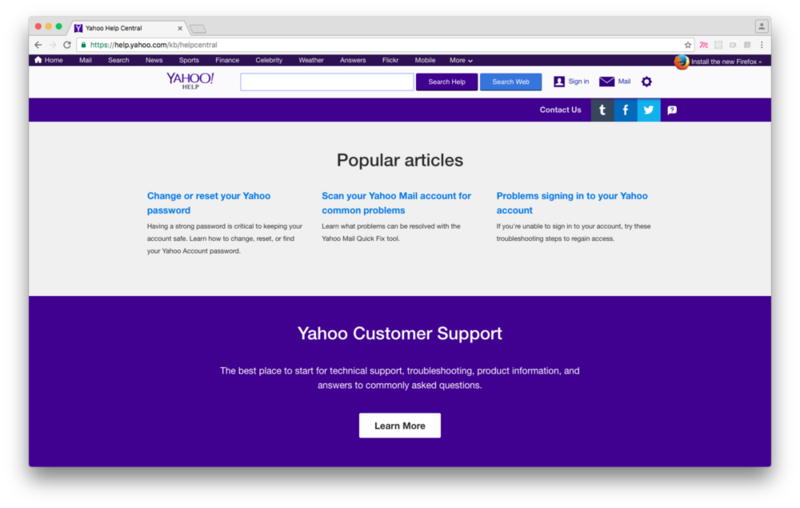 Revamp the existing Help.Yahoo site which directs users to help articles, support agents, and necessary tools. Evaluating the existing site for usability and a redesign focusing primarily on the content help articles. Redesigning the flow for users to connect with support agents by adding better messaging and increasing the presence of user options. A little under a year before the site came underneath my responsibility, the existing Help.yahoo site was designed by an outside agency. The site utilized an older Yahoo visual style verses the new Fuji brand styling of Yahoo. It also presented with a variety of usability issues. Over a few dozen usability studies were conducted on the existing site to uncover pitfalls and issues. Below are a few selected examples. After analyzing the existing site's usability issues, I created a detailed diagram of the current site's architecture. The final analysis revealed the site had only three possible outcomes for the end user. The user can either find a help article, connect with an agent or find a tool (i.e Password Recovery Tool). Yet, the Help.Yahoo site had an enormous amount of paths to reach the same outcomes. The purple circles represent the three possible outcomes for the end user. The blue lines represent the variety of paths a user can take. Existing UI does not visually express the various possible outcomes. The three circular buttons to the right represent three different outcomes but utilize the same visual elements. Displaying recommended articles based on data identifying most requested information. Menu to select specific platforms. User research revealed that a user’s did not organize products in the same manner as the business. The business saw their products in categories such as finance, sports and news. Instead the users mentally organized the various products into personal use and business use. The navigation bar is organized by products with the most requested help. When the user navigates to a product not displayed on the initial navigation bar, an additional navigation item is added.